Description: BNSF loaded Rawhide Mine, WY to TXU Power Big Brown, TX coal train C-RWMKBB0-94A - BNSF 5848, BNSF 5948, 117 loads, 0 empties, 16642 tons, 6504 feet, DP units BNSF 6132 and BNSF 9151 - BNSF Wichita Falls Subdivision. Description: I had to chase the E-PEDETM to Yates City. I know the power wasnt exciting, but I wanted a train. Description: After passing the BNSF 7548; BNSF 6132 is a solo leader on this SLC coal load. This train has 2 DPUs both 70Macs. 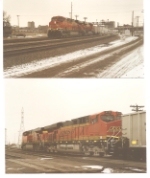 Title: BNSF 6132 Leads a empty coal Nb. Description: Stretched out on the Bnsf Hannibal Sub kinda strange for a empty coal to run 1x1. Title: BNSF 6132 If this tree could talk!!! Description: Taking a nb empty coal up the K line at 25 Mph due to bad track conditions. Description: You can kind of see a GEVO here, right? 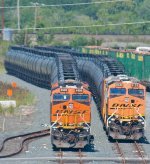 Description: Two loaded oil trains sit side by side near the east end of the yard in Selkirk NY. 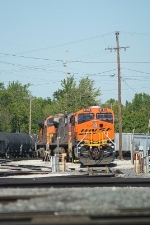 BNSF 6599 leads the train on the left while BNSF 6132 leads the train on the right.